Senator James Manager from Delta has expressed pride and a sense of fulfillment for being one of those who screened and confirmed the NAHCON boss for the appointment due to the good job he is performing in the Commission. The Senator made the remark when The National Hajj Commission of Nigeria submitted its 2018 budgetary performance report and defended the 2019 proposed budget to the Senate Committee on Federal Character and Inter-Governmental Affairs in the National Assembly Complex on 2nd April. Presents are Senator Danjuma Laah, representing Kaduna south, who is Chairman of the Committee and assisted by Senator Rafi’u Ibrahim Salihu and Joshua Lidani as members. “The Senate Committee on Federal Character and Inter-Governmental Affairs oversees matters of all agencies under Office of the Secretary to the Government of the Federation, OSGF”. Similarly, in continuation with the budget defence, the Commission on 4th April made its presentation before the Senate Committee on Foreign Affairs, followed by another presentation to the House Committee also on Foreign Affairs same day. In his submission, Chairman of the Senate Committee on Federal Character and Inter-Governmental Affairs, Senator Laah described NAHCON’s proposed budget as fair. Senator Monsurat Sunmonu, Chairperson of the Senate Committee on Foreign affairs commended the Commission’s presentation describing it as very clear and straight forward. She concluded that if there is need for more explanation NAHCON will be re-invited and if not, she wished the commission good luck. Senator Ashafa sought explanation over a rare diversion from what he described as the norm in yearly budget proposals. Instead of cost of office rent going up from those of previous year’s, that of NAHCON went down significantly in 2019. NAHCON Chairman attributed this to the new office complex headquarters that the Commission acquired and is planning to move soon. Having no further need of those expenses, the Commission believes government can channel the funds in managing its other concerns. 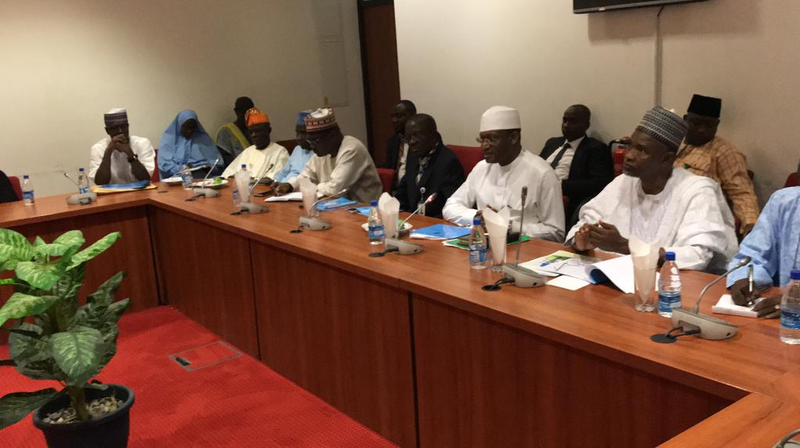 Present at the Senate Committee’s sitting were Senator Shehu Sani from Kaduna, Olugbenga Ashafa from Lagos and Senator James Manager from Delta. On her part, Hon. Nnenna Eledu Ukeje, was full of commendation for what she described as the most modest budget she has seen so far: straight forward, devoid of ambiguity, transparent with all expenditures clearly captured including the unspent. She opined that acts like these give hope that indeed government’s policy thrust on transparency is tenable. On his part, the NAHCON Chairman thanked all the National Assembly members for their kind words and expressed how enthused he has been in working with them gathering wisdom and experience. He implored their support to facilitate timely release of the grants to enable the Commission discharge its responsibilities unhindered. Barrister Abdullahi Muhammed addressed a range of worries raised by the members ranging from problems of absconding, drug and human trafficking, private tour operators breeching contract agreement with pilgrims among others. He dislodged their fears assuring that most of the organised crimes mentioned are carried out not during Hajj journeys but under other guises. He informed that within the last two years for example, no case of drug trafficking was recorded during Hajj exercise.